Valdez-Cordova Census Area county, Solo Creek airstrip to Alaska Highway Bridge section whitewater kayaking, rafting, and paddling information. The White River is difficult to find information on. 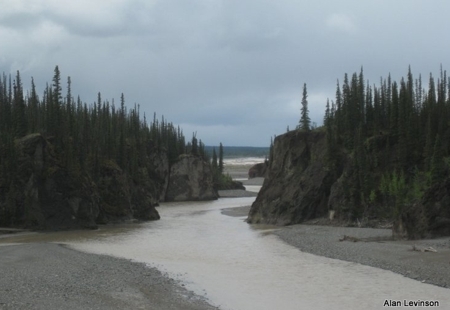 What I saw running it from Solo Creek to the Alcan Highway bridge in June of 2018 is a Class II river, but is more difficult in very small sections, like entering the first canyon. This is my summary from the water level that I saw, which was low due to a cold spring and cool start to summer (we had snowfall several times during our trip). there is no sign of human life in the region except for the guide camp at Solo Creek and the RV campground just south of the Alcan bridge at the take out. The take out should be correctly located at Lat: 61. 99° Lon: -140. Crossing of the international border needs to be carefully considered. Contact Canadian Customs remote entry by marine craft to understand the necessary steps. The first canyon, which is downstream of the border, is narrow and powerful and has limited options for reconnoitering. There is a section before (maybe 2-3 miles) the first canyon where the river narrows but is not the canyon. These outdoors activities are available near White River.